Home » Media » CNN Rebecca Berg Is Getting Married? Boyfriend Moments Scream Yes! American journalist Rebecca Berg looked absolutely stunning flanked by her boyfriend as she attended her mother's second wedding and looked at home as bridesmaid. The way she enjoyed seeing her mother exchange the vows made everyone believe that she was soon to tie the knots herself. But did she follow her mother's suite by getting married? The born and bred San Dieguito is an American journalist best known as the CNN political reporter based in Washington, D.C.
Before working in CNN she worked as a reporter for various paper mags such as RealClearPolitics, Buzzfeed, and The Washington Examiner. Moreover, she has also appeared in several other news networks such as Fox News, MSNBC, CBS, and C-SPAN. San Diego native Rebecca Berg was born on January 17, 1990, as the daughter of Kris and Steven Ira Berg. She belongs to a Jewish family and grew up along with her parents and sister Emily Berg. Her father worked initially as a city planner and later as a real estate broker in the San Diego Castles Realty founded by her mother Kris. The family shared a blissful life with each other but were hit by a setback in 2013, when she lost her father at the age of 61 after a brave fight against cancer. The CNN diva, aged 28, gained her high school level education at San Diego. After completing her schooling Berg graduated with a degree in Journalism and Political Science from the University of Missouri. After graduation, she was selected as a summer fellow in Washington for The New York Times. She officially started her career in the field of journalism in 2012 as a 'Political Reporting Fellow' for The New York Times. Soon she became a professional in the field and served as a political reporter and correspondent for many news networks. 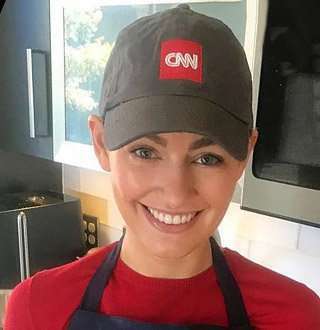 After gaining her education from various news network she finally landed a dream job with the national broadcasters CNN. It was the year 2017 when she was appointed as a political reporter in CNN. After working in multiple renowned news networks and having finally landed her dream job in a big news network like CNN, Berg has undoubtedly amassed a huge net worth. Despite having kept everyone in dark about the actual net worth figures, her salary at CNN does give a bit of hint away. She is believed to be earning a handsome salary ranging from $70K - $99K working for CNN which does imply that she could have a net worth in millions. The tall and gorgeous reporter with a height of 5 feet and 7 inches hasn’t only been making the best out of her career but also the best out of relationships, as she has been together with her boyfriend for the last five years. The talented journalist is dating Brendan Buck since 2013, and her boyfriend is a counselor to house speaker at US House of Representatives. Despite shedding little info about how their romance sparked a quick swipe through their IG posts reveals that the year 2013 was the year of love for Berg and Brendan. They started publicly dating since 2013 and since then has been sharing their love life openly on social media. And it is through their IG posts, the couple share about their romantic getaways and vacation. Moreover, the couple also attended a wedding of a close member of their family of late which started the clamors for their marriage. When Is Rebecca Berg Getting Married? After the pain of losing her father, Berg's mother decided on giving a new chance to let love in her life bloom once again. Her mother remarried in 2017 after finding her a partner for life. Berg attended the wedding with her own potential husband-to-be by her side and they even shared a romantic picture of them together during the wedding ceremony. Moreover, the CNN journo and her boyfriend were seen deeply immersed in the rituals that have to be followed during her mother's marriage, which led to the grapevine speculating that the lady could be making her preps for her own big day. Having experienced her mother's wedding, it looks like Rebecca might also be planning for her own wedding in the coming year. Having shared the bond of love for years, all that has been missing from her life is the tag of married. And we would love to see this couple turn husband and wife soon!